The warmer weather months are just around the corner. This delicious no-bake chocolate cookie recipe is perfect for those times when you want to satisfy your family’s sweet tooth but don’t want to heat up the kitchen. Actually, my family enjoys these delightful little cookies any time of the year! 1. In a medium saucepan, combine the sugar, cocoa, milk and butter. Bring to a boil over medium heat, stirring often; cool for 1 to 2 minutes. Stir in the vanilla, pinch of salt, peanut butter and oats; blend thoroughly. 2. Drop by teaspoonfuls onto waxed paper; cool and then chill in refrigerator until set. Makes about 48 cookies. Man, now I am really in the mood for some of those! 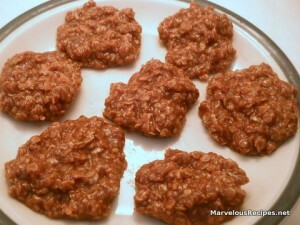 Hi Emily, It is a hoot that you have shared your no bake cookie recipe today. We are getting ready to leave in the morning and I put in the ingredients for no bake cookies. I have also made them without chocolate and they are delicious. I have never used the oven in the RV because I couldn’t figure out how to light it. I know that is lame but the no bake cookies are the answer. I have a toaster oven for small baking and toast. Thank you for your sweet comment about our trip. I will be posting again when we arrive in Maine. I did prepost a couple of days such as Pink Saturday and Memorial Day. We are so excited about this trip. Lots of new blog material up there in Maine. smile.